In 1980, only 2.3 percent of workers telecommuted. Today, estimates put the number of Americans calling home their permanent office at over three million. The next few years will see telecommuting numbers grow by 63% according to the Telework Research Network. The average telecommuter nowadays is a 40-year-old professional male with a university degree and not a work-from-home mom. Current research reveals more companies are offering telecommuting than any other new benefit. The progress of technology has helped accommodate the telework option. Wireless devices, web applications, and collaboration tools, such as online meeting software, make it easier to interact with managers and colleagues when you're not in the office. They can focus better on their tasks with fewer disruptions. They avoid a long commute, which is more environmentally friendly and saves valuable personal time. They save on fuel or transit costs. To save on real estate, office supplies, and other overhead costs. To encourage productivity and reduce expenses associated with lost time due to disruptions. To foster a "green" workplace culture. Less face time with managers and peers can be a major communication roadblock. Moreover, the benefits of brainstorming and innovation through on-site collaboration diminish. Employers can’t control how workers use their time. This leads to worries about lost productivity. And when employees are on hourly contracts, there’s no guarantee that paid time is spent on work-related activities. Yahoo banned the arrangement in 2013 because of abuse of the remote work system. When this benefit is available to selected staff only, jealousy and resentment can cause an adverse working environment and can affect morale. There are instances when it doesn’t make sense to have IT staff working from home. Companies must consider the individual's role and the needs of the departments that he or she interacts with the most. Certain problems are impossible to troubleshoot remotely. Security issues and compliance with regulatory requirements limit access to development tools, software, and other applications. In these cases, workers can’t carry out their duties off-site. If you have an IT job where you work independently most of the time, working from home could be possible. A software developer, for example, is a good candidate for teleworking. If you're in a phone tech support role with no requirement to go to the user's desk, telecommuting may work for you too. Make sure you go to the office once in a while. If you work from home full-time, it's a good idea to interact with colleagues in person to keep the lines of communication open and maintain relationships. Attend regular face-to-face meetings. Discuss expectations with your employer. Know when you're expected to be on-site, and make sure you're familiar with the company's telework policy. Establish communication protocols. Make sure people know how to reach you during work hours, no matter where you are. Use a schedule for tracking progress. This will help both you and your employer gage how productive you are when working from home. Both employers and employees should consider the effects of telework on business performance. What’s ideal for one company or person isn’t the same for another. Workers don’t always operate well in isolation, and extroverts often prefer being in an office environment. 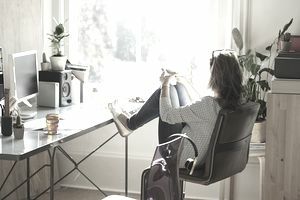 To avoid negative impacts from telecommuting, companies must set out clear guidelines and policies on productivity, security, and workers’ compensation. What Is It Like to Be a Computer Support Specialist?